'My dears: this is but a brief note to welcome you to the new world, where you are now no longer all too far away from us. ‘ So begins Adorno’s letter to his parents in May 1939, welcoming them to Cuba where they had just arrived after fleeing from Nazi Germany at the last minute. At the end of 1939 his parents moved again to Florida and then to New York, where they lived from August 1940 until the end of their lives. 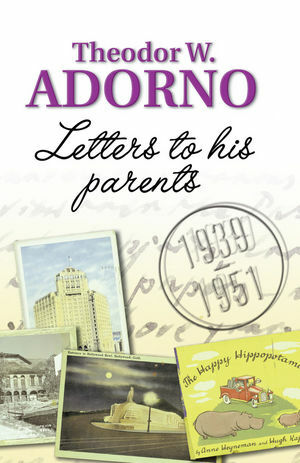 It is only with Adorno’s move to California at the end of 1941 that his letters to his parents start arriving once more, reporting on work and living conditions as well as on friends, acquaintances and the Hollywood stars of his time. One finds reports of his collaborations with Max Horkheimer, Thomas Mann and Hanns Eisler alongside accounts of parties, clowning around with Charlie Chaplin, and ill-fated love affairs. But the letters also show his constant longing for Europe: Adorno already began to think about his return as soon as the USA entered the war. "Adorno’s childhood always served him as a recollected utopia of protected bliss. The publication of his extensive correspondence with his parents well after that paradise was lost demonstrates its enduring power in his adult emotional life. Poignant, loving, anxious, at turns intellectually serious and childishly goofy, these letters not only testify to the strength of his family’s bonds, but also provide invaluable evidence of the struggles of German exiles in their new homeland. Scrupulously translated and exhaustively annotated, Adorno’s Letters to his Parents is a document of unique importance for anyone interested in the history of the Frankfurt School and for the migration as a whole." These letters offer the reader a fascinating insight into the life of one the most important figures of twentieth-century intellectual life. The letters touch upon issues of great personal and historical significance: the Nazi regime in 1930s Germany and the Second World War; the experience of the intellectual in exile. The letters are extensively annotated and provide the reader with detailed notes concerning the writings, events and personalities referred or alluded to in the correspondence. Will be of interest to students and scholars of Social Theory, Cultural History, and those whose research and writing is devoted to T. W. Adorno and the Frankfurt School.